Wildwood Guitars is a fast-paced workplace, and we’re usually hard at work serving our exceptional customers from the moment we get here to the moment we leave. However, once in a great while, there’s a lull in the action and we get a chance to sit down and play guitar for couple minutes. When these rare idle moments occur, a curious thing happens: despite the vast array of guitars at our fingertips, Wildwood employees almost always pick up one of the GS Minis on our showroom floor. Of course, we love our 800-series Taylors and Custom Shop Strats, but there’s something magical about the GS Mini that draws us in. It might seem strange that a so-called “travel guitar” holds the entire Wildwood staff under its spell, but it totally makes sense once you realize that the GS Mini isn’t a “travel guitar” or a “student guitar” or a “7/8th-sized guitar.” It’s a just a really well-built acoustic guitar, albeit one that sounds and feels like nothing else on the market. Let’s take a closer look and see how Taylor built one of the most exciting, innovative acoustic instruments of the last decade. The GS Mini’s awesomeness begins with the beautiful mind of Bob Taylor. 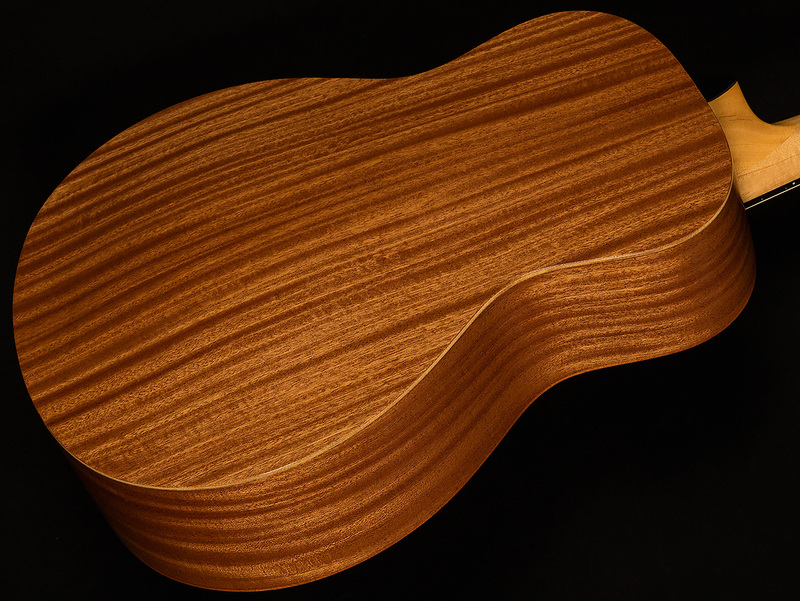 When Bob designed the Mini, he shrunk down Taylor’s iconic Grand Symphony shape by fifteen percent while preserving the shape and geometry of the bigger guitar. So, the GS Mini has a larger lower bout than most short-scale acoustic guitars, but the waist is still narrow. This gives the GS Mini powerful low-end while allowing for much greater comfort during lazy couch pickin’ sessions! 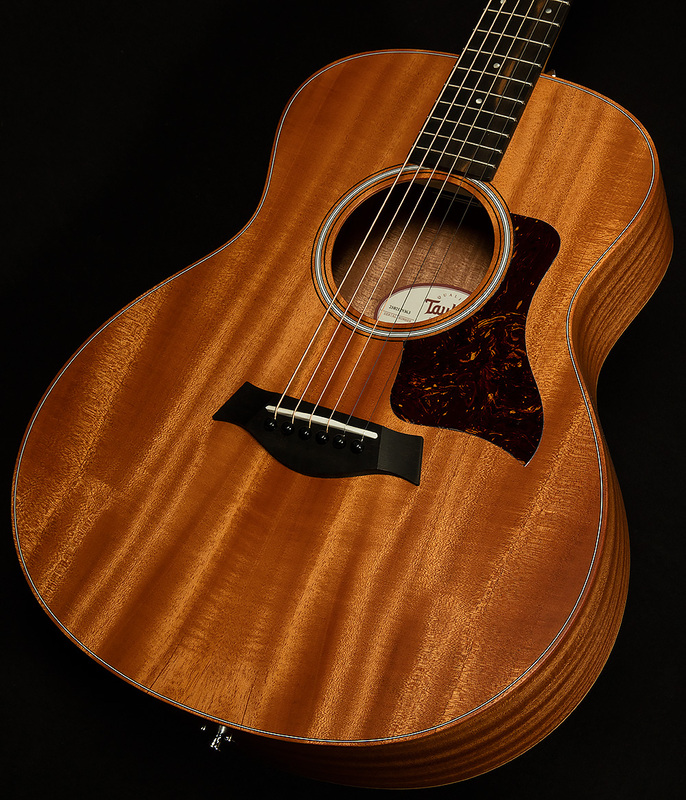 The body also features a solid mahogany top for added warmth and midrange depth. By contrast, the sides are made of layered wood, which gives this guitar exceptional stability and durability. Much of the GS Mini’s extra voodoo comes from the way the short-scale neck interacts with Taylor’s special GS Mini bracing. The necks on these puppies are 23.5” long, which would ordinarily result in a dark, thumpy tone with lots of give on the attack; in other words, exactly the sort of flabby, undefined tone Taylor wanted to avoid. To fix that problem, Taylor gave these guitars a special X-bracing pattern that helps tighten everything up and enhance projection. It also allows the GS Mini to handle a flatpick like a dreadnought while remaining responsive enough to delight fingerpickers. Bob Taylor also designed the GS Mini’s bracing pattern specifically to work well with medium-gauge strings. Thicker strings mean thicker tone, and they also mean more tension. The extra tension helps this guitar stay as tight as most guitars with regular scale lengths without hurting playability at all. In fact, the GS Mini has a slinky, buttery handfeel that practically begs you to play all day long. You get all the benefits of thick strings, but your left hand doesn’t have to work any harder! Hopefully now you have an understanding of the strange, eldritch power of the Taylor GS Mini. It’s small enough to travel with and it plays easily enough for a student to learn on, but it is neither a travel guitar nor a student model. It’s a small, short-scale guitar that has been engineered with care and precision to sound much bigger than it has any right to. In fact, its cannon-like bass, forceful mids, and bold trebles all sound rich enough to make you forget that GS Mini is fun-sized! The GS Mini’s superior blend of comfort, playability, and big tone is what makes us grab one whenever we have a few spare minutes to play during our workday, and we’re sure you’ll find yourself reaching for your GS Mini just as much as we reach for ours.